PIRATES!!! Man the cannons! Load your muskets! If they want to board us, by hades they'll taste our steal. The "High Seas Battle" SoundSet brings you all the glory and chaos of a battle on the water, all accompanied by six fantastic rollicking Jigs and Reels. Including OneShots for Pirate "Arrrrrr"s and an almighty boat on boat impact sound, this SoundSet will give you all you need to make your Players want to stay on land for the rest of their short lives! This SoundSet includes four new Global OneShots = Sword Clash, Sword Swoosh, Arrow landing in wood, and Arrow landing in flesh. 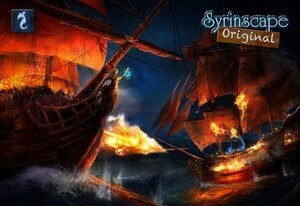 These Global OneShots will appear at the bottom right corner of the Syrinscape Fantasy Player.